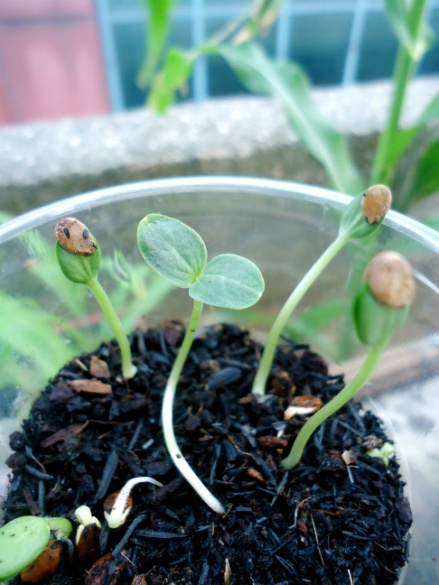 Start by planting seeds in small plastic cups filled with soil. It’s best to plant one seed in each cup for easier transplanting. Then, sprinkle fertilizer on the soil to help the seedling grow. After two weeks, it will most likely grow 4-5 inches long. By this time, you’ll see heart-shaped leaves (well, sort of) which have a furry texture. 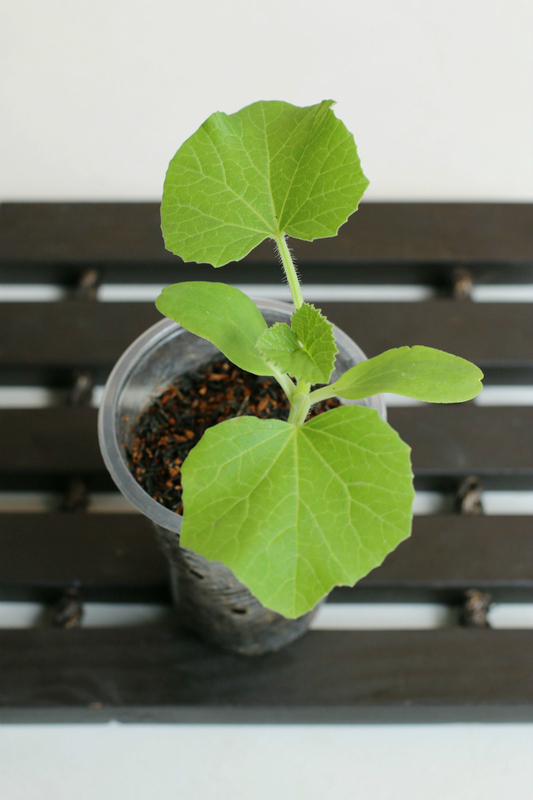 When the seedling is about 4 inches long, you may transplant it so its roots can grow deeper in a bigger bed or pot of soil. You may use a large pot that is 15” wide and 15” tall. Any pot or container with a similar or larger dimension is enough. Before carefully transferring the seedling, make sure to sprinkle fertilizer on the soil and mix thoroughly. I usually add 2-3 tablespoons of powdered organic fertilizer to loose soil. One important factor to consider when transferring the seedling is being gentle with the roots. Transplanting can be very stressful for any plant, so try to do your best not to damage or cut the roots in the process. 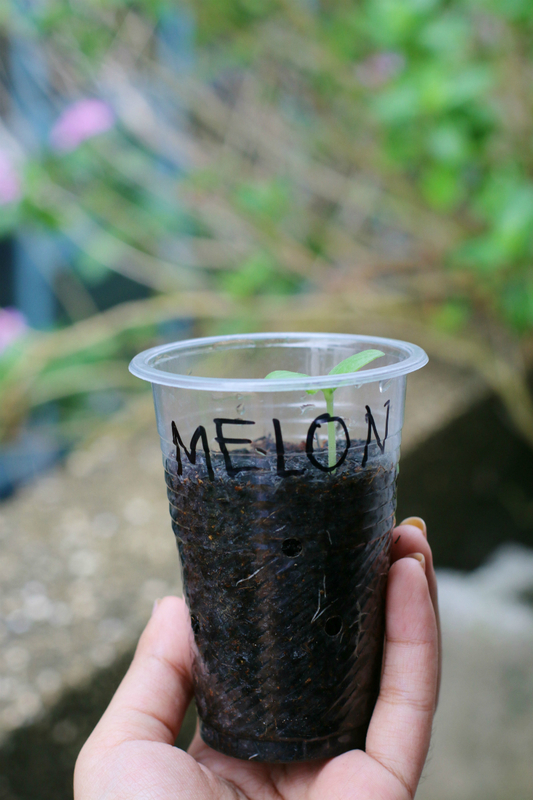 Also, once the seedling is placed in its new container, its roots must be covered with soil and mulch (e.g. dried leaves, hay, etc.). This will protect the roots from being exposed too much to the heat of the sun. This is one unique trait of fruit-bearing vines. They grow male AND female flowers. The latter ones eventually become the fruit, when they are properly pollinated with the male flowers. It’s important to look out for the flowers when the plant is growing because the female flower only opens up for a few hours in its lifetime. 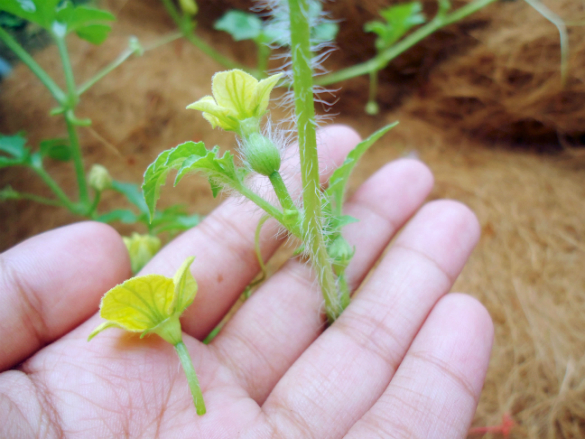 If you don’t get to transfer pollens from the male flower to the female flower, the fruit won’t grow. 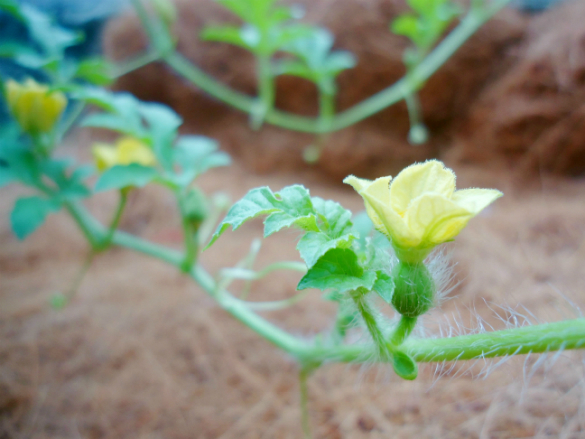 The male flowers will first appear and then, after a few days, female flowers will bloom too. The difference between the two is the flower’s stalk. The male flowers have a thin stalk; while the female flowers will have a rounded one, similar to having a small ball below the yellow petals. When the fruit-bearing vines are grown in larger areas like farms and fields, pollination is usually done by the bees. 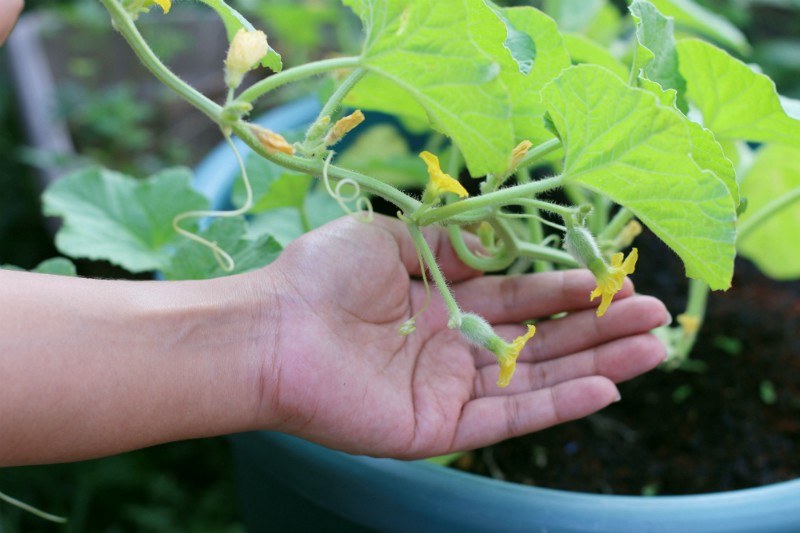 But, if we want to grow fruits from vines in smaller containers at home, it would require pollination by hand. How exactly do we pollinate by hand? It’s a simple process, but it can only be done when the female flower opens up. 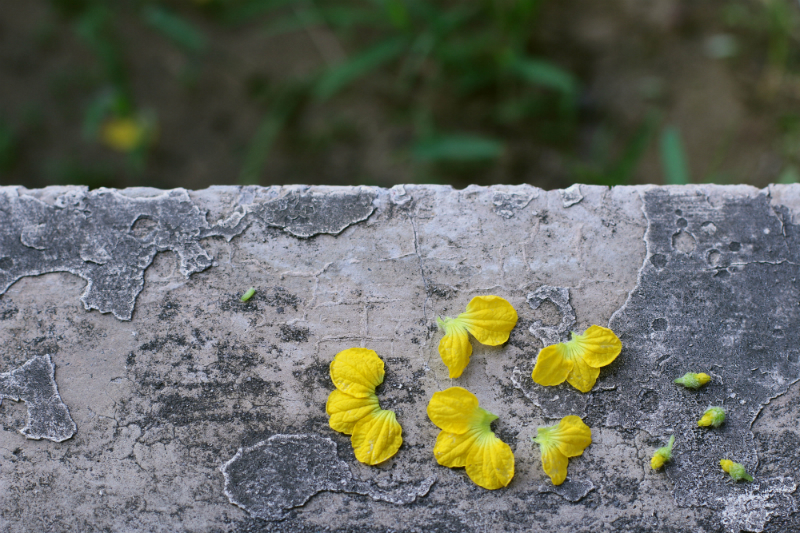 Once you see the petals of the female flower spread out, you can get one to three male flowers and remove its petals. Our goal is to transfer the yellow dots (pollens) from the middle of the male flowers to the bud of the female flowers by carefully rubbing it against the latter. After a few hours, you’ll notice that the petals of the female flowers will start to close up and cover the bud. Then, in a few days, it will begin to form the fruit. You can add fertilizer to the plant every time it goes through the different stages of growth (e.g. 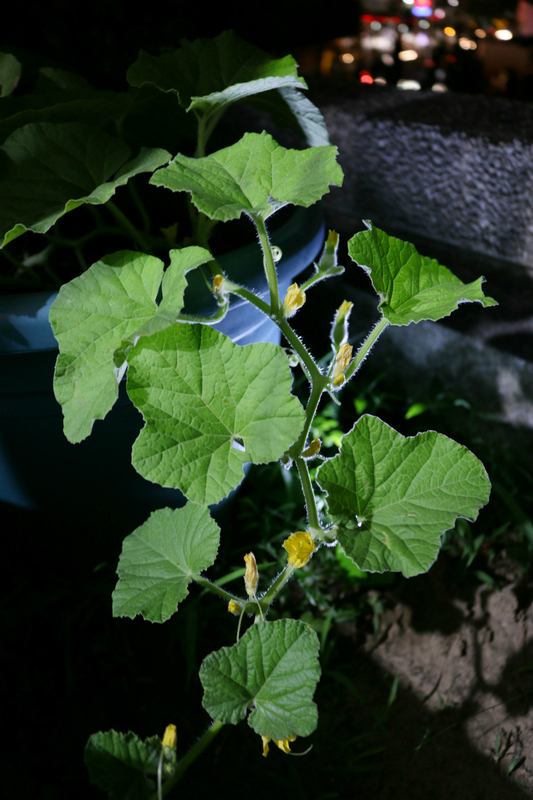 when the plant grows it leaves, longer stems, flowers, and fruits). Another option is to add fertilizer every two weeks. On the other hand, when it comes to watering the plant, you can water the plant once a day, depending on the weather in your area. Since it’s hot and humid in the Philippines (where I live), I usually water the plant once or twice a day. 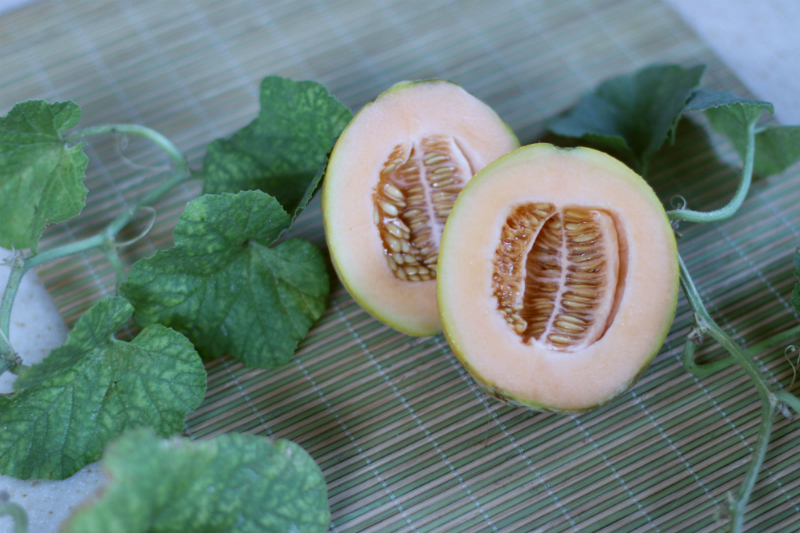 However, by the time the fruit matures, it’s best to lessen the water added to the plant’s soil. 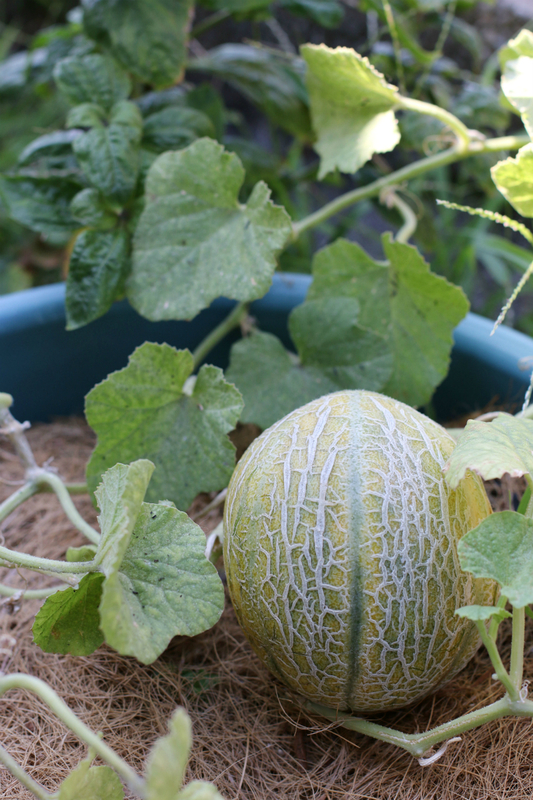 Overwatering may hinder the fruit from reaching its maximum sweetness. a. 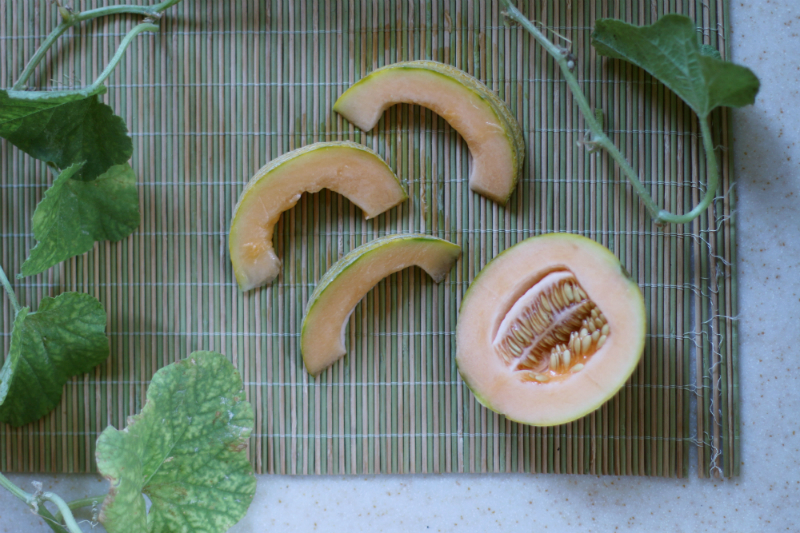 The color of the melon will turn from green to orange or yellow orange. b. 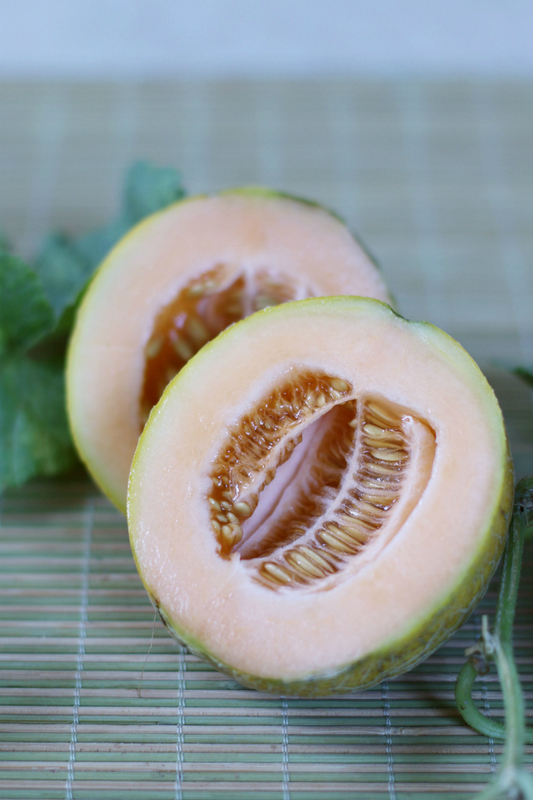 The fruit will have a sweet smell especially when you go closer to the stem of the fruit. 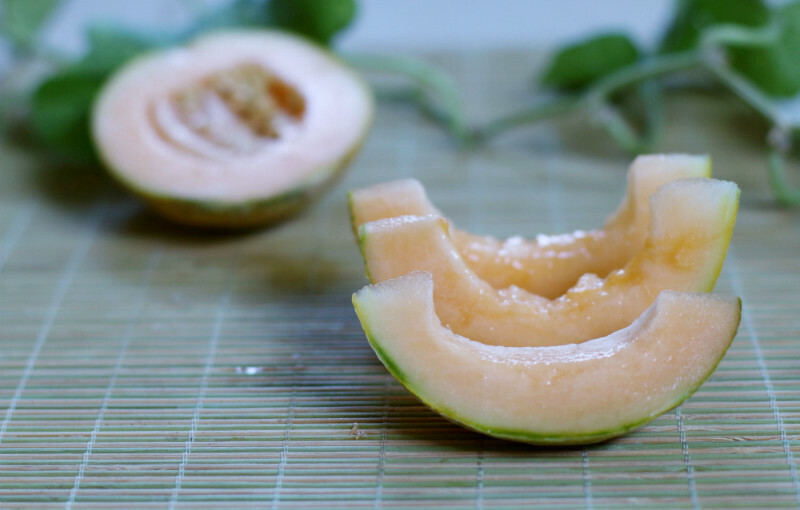 c. The stem will easily detach from the fruit when you slightly move the melon. 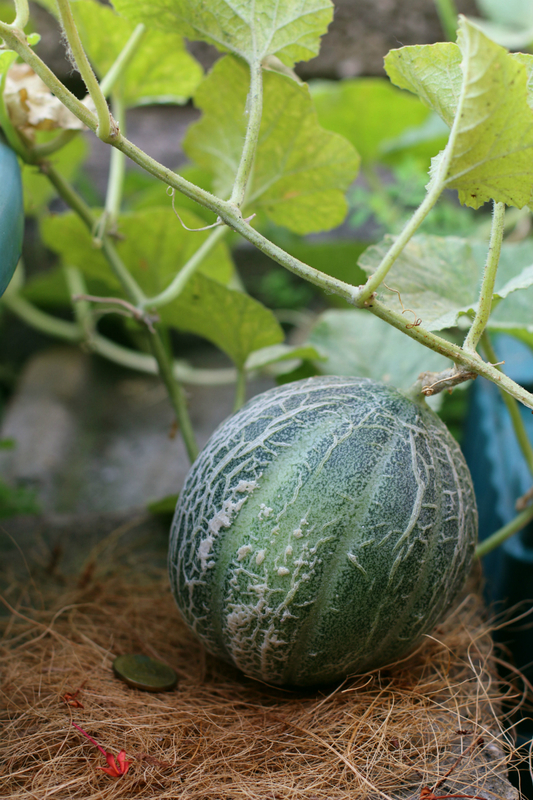 If you are into gardening, growing fruits from vines is a fun and challenging experience that I would recommend. 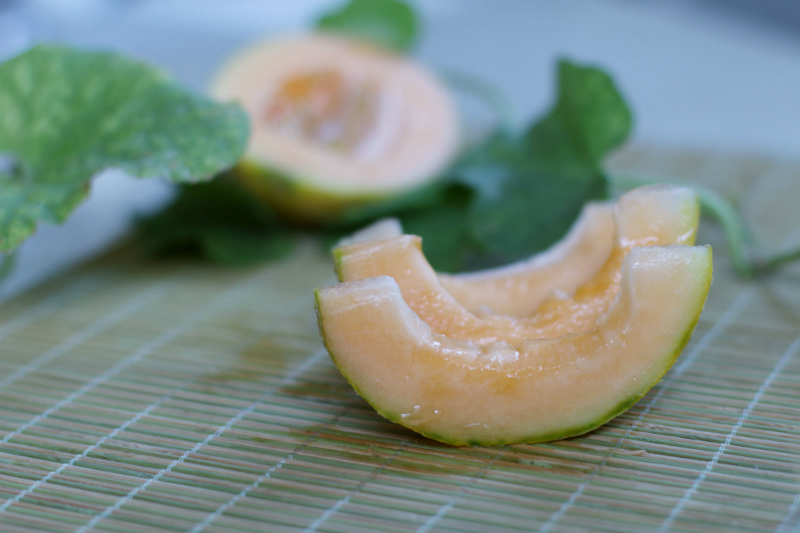 There’s nothing like slicing a sweet, homegrown melon in half and seeing the seeds and juices flow on the chopping board. 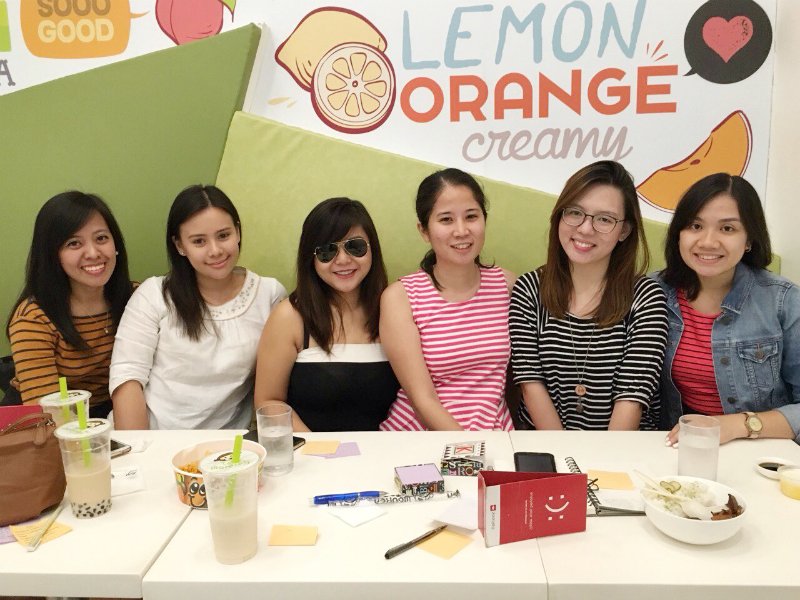 It was such a refreshing and delightful moment! If you would like to give it a try, I would encourage you to plant the seeds in January or February, so you can harvest it by March or April. Fruit-bearing vines don’t grow well during the rainy season. Hopefully, I can try to grow more early next year. I have recently embarked on a new gardening adventure at home. 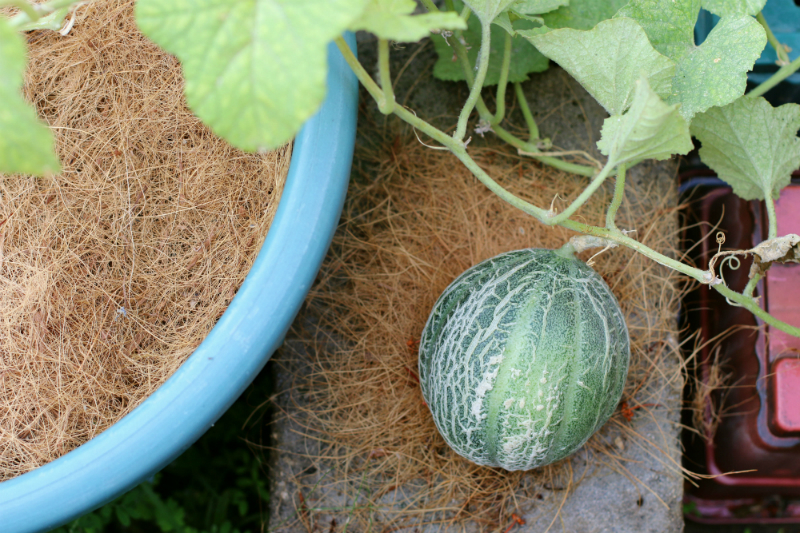 By faith, I am growing watermelon vines in a container bed! Yay! It all started when I was eating a slice of sweet watermelon in the cafeteria at work. 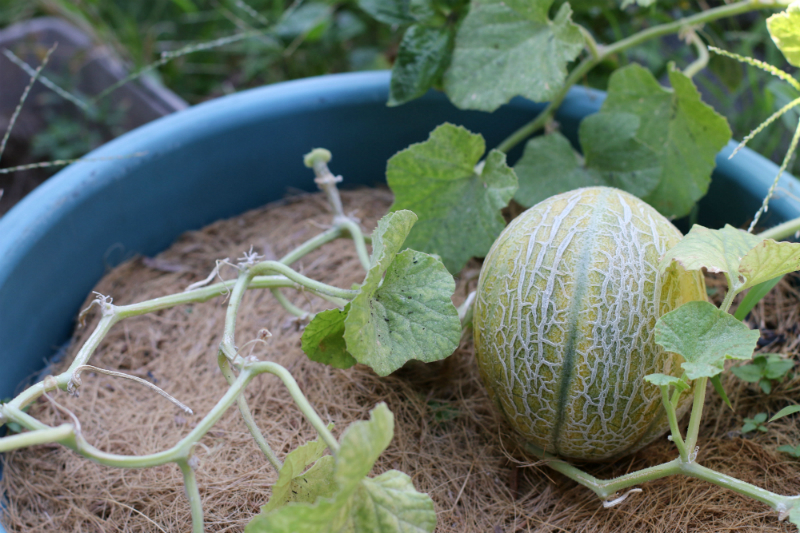 My colleague and I were talking about some of the vegetables I’ve planted and I made a joke about planting the watermelon seeds from the slice of fruit that I was eating. 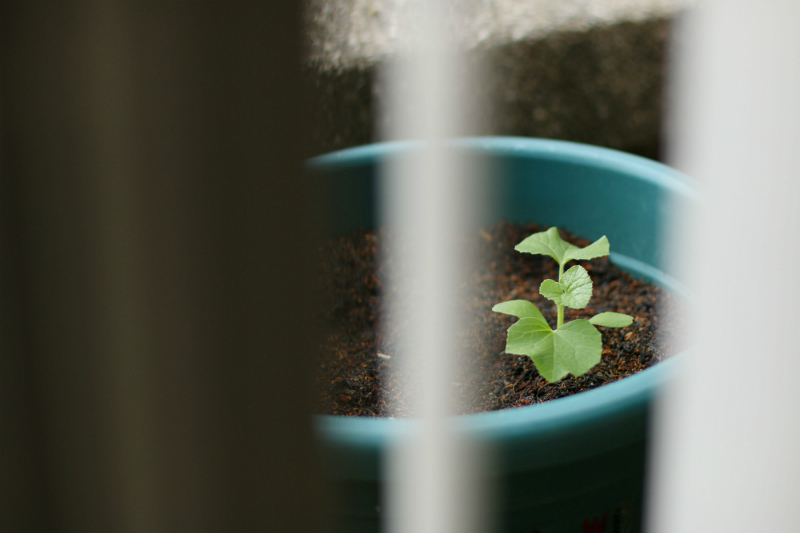 Nonetheless, I went home that day with a small container filled with seeds and I planted them in a cup of soil. I really enjoy planting and growing seeds because I get to experience the privilege of knowing God more and I get to witness the seeds grow and bear fruit. I still have a couple of months to go before I harvest (by faith!) sweet watermelons. But, for now, I would like to share more about what I am learning from the vines I’m currently growing and how I am encouraged by God — who is always on time. About a week after I planted the seeds, I came home from an out-of-town trip with friends and I remember checking my plants first before I slept that afternoon. 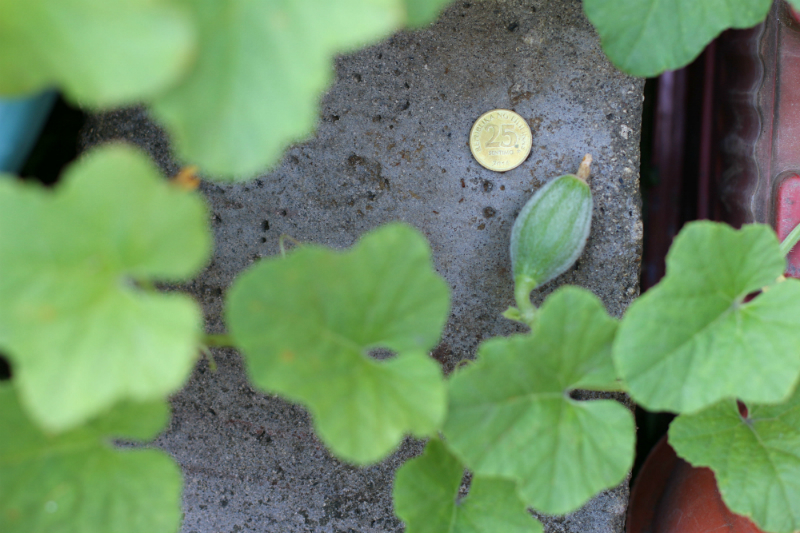 To my surprise, I saw several sprouts growing in the cup where I planted the watermelon seeds! 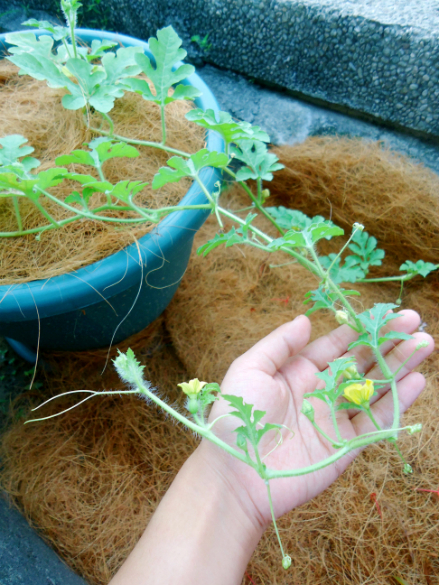 The sprouts looked so sturdy compared to the other fruit/vegetable sprouts I’ve grown. Also, they were beautifully long and happy. 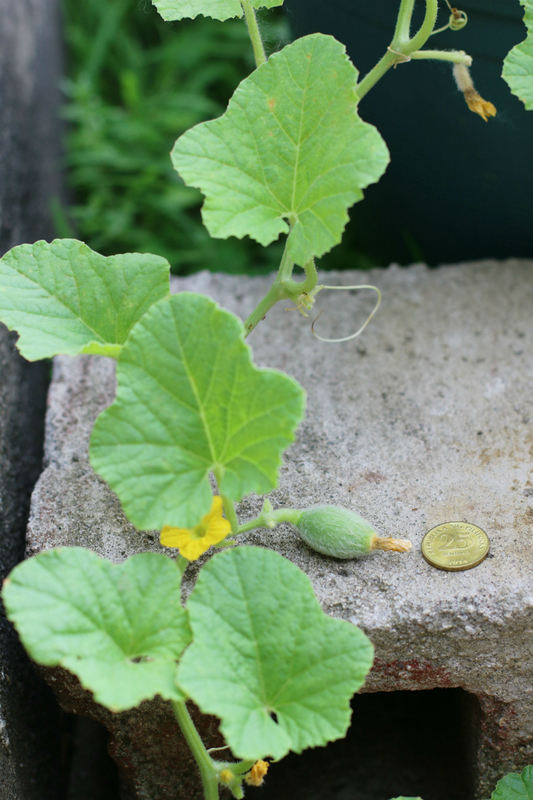 They even had the brown watermelon seeds attached to the leaves which gave me the assurance that they weren’t just weeds. When the sprouts grew bigger, I transferred them to a larger bed. Every day for five weeks, I watered the plants and provided fertilizer and mulch to help them grow. 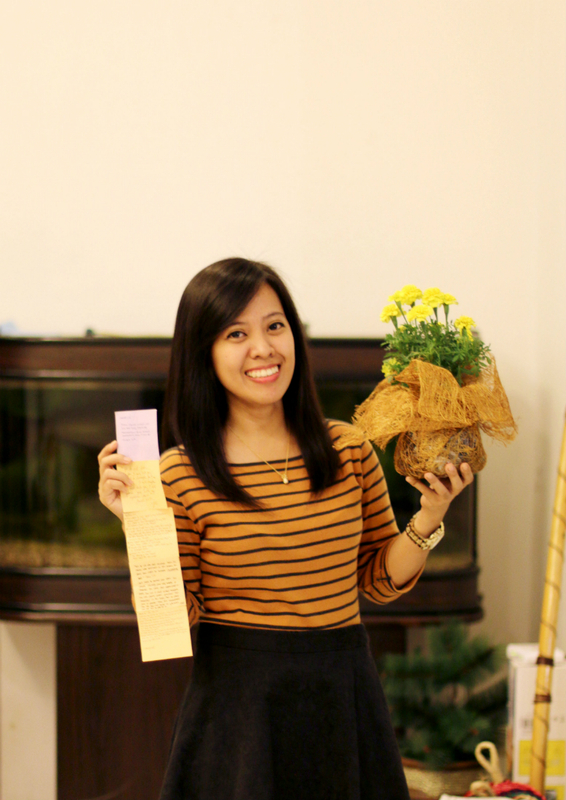 Taking care of vines at home is pretty exciting especially since it’s my first time to grow them. 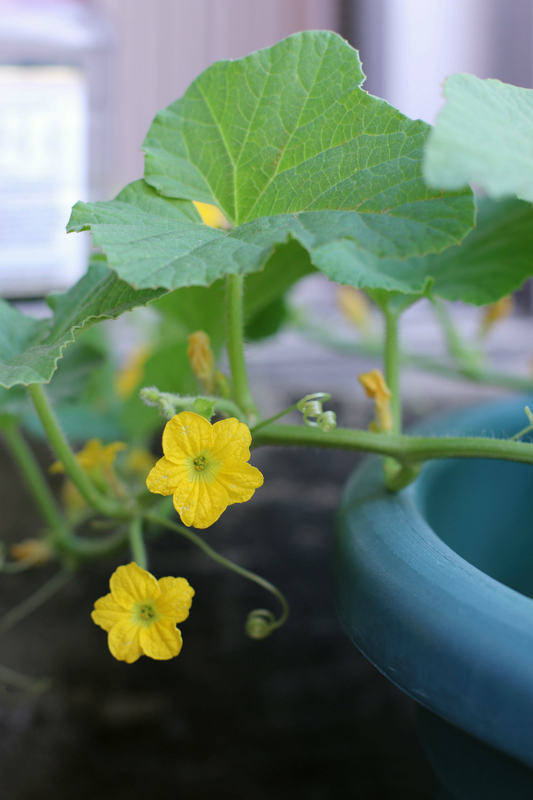 As I studied the different stages that the vine goes through, I learned that watermelon plants have male and female flowers too. When I found out about it, I remembered how my corn plants also had male and female flowers and how they also needed to be pollinated by hand in order for them to produce kernels of corn. 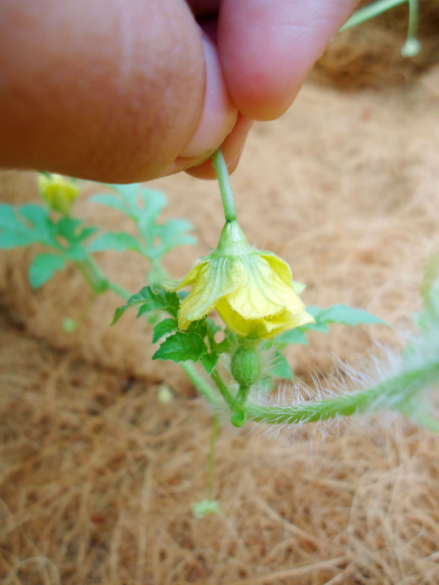 Pollinating the male and female watermelon flowers by hand. 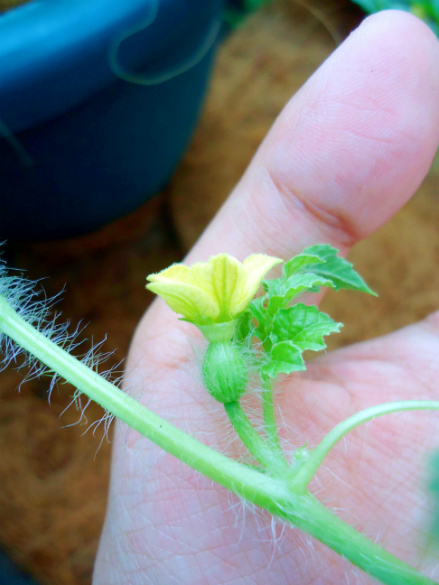 However, the main difference between pollinating corn plants and watermelon flowers is the TIMING. Yes, for both plants, it is advisable to pollinate in the morning so that the sun’s heat can help activate the pollens once they touch the female flowers. BUT, corn plants can be pollinated everyday for a week since the tassels can produce pollens for days. If you missed a day, you can still pollinate the corn plant the next day. 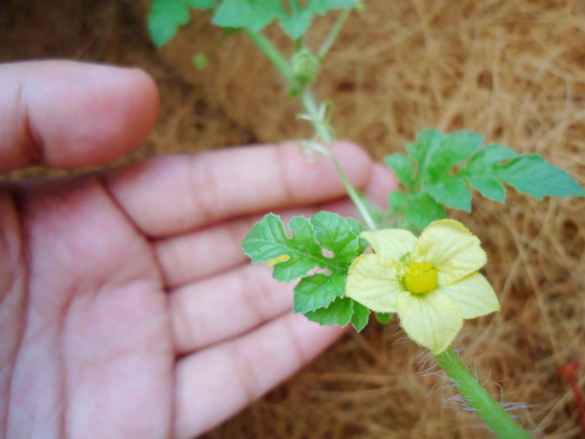 On the other hand, for the watermelon vines, the female flower opens its petals for only ONE DAY. 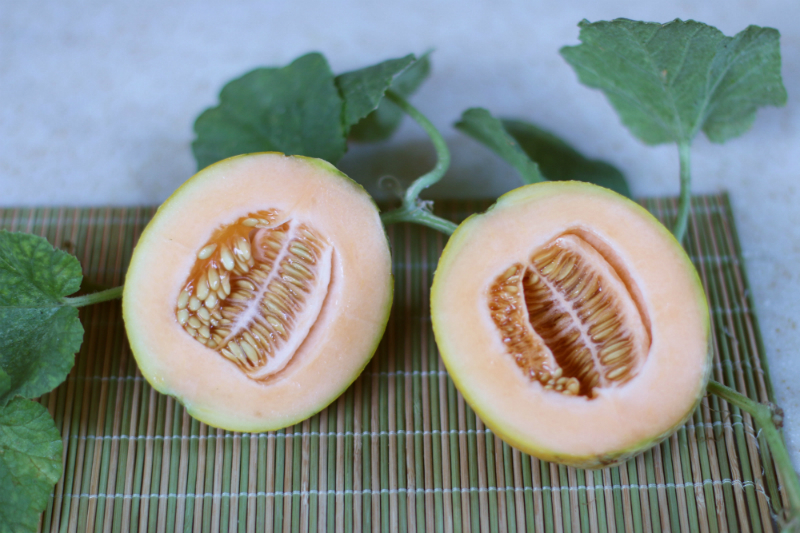 If we don’t get to brush the pollens from the male flower to the female flower in the morning on the only day it opens up, the watermelon fruit from that female flower won’t grow. It will only dry up and die. Last June 28, I saw the first few male flowers growing on the vines. Every day after that, 1-2 male flowers would grow and then, dry up. I was already starting to panic because more and more male flowers were growing and I knew that in a few days, the female flowers would then start to appear and open its petals for only a day. 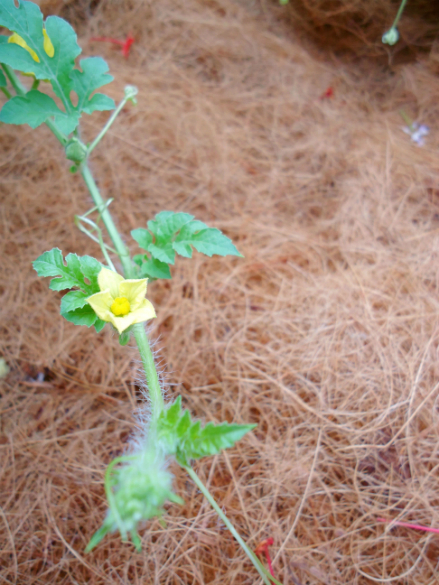 Finally, two days later, the first female flower appeared. 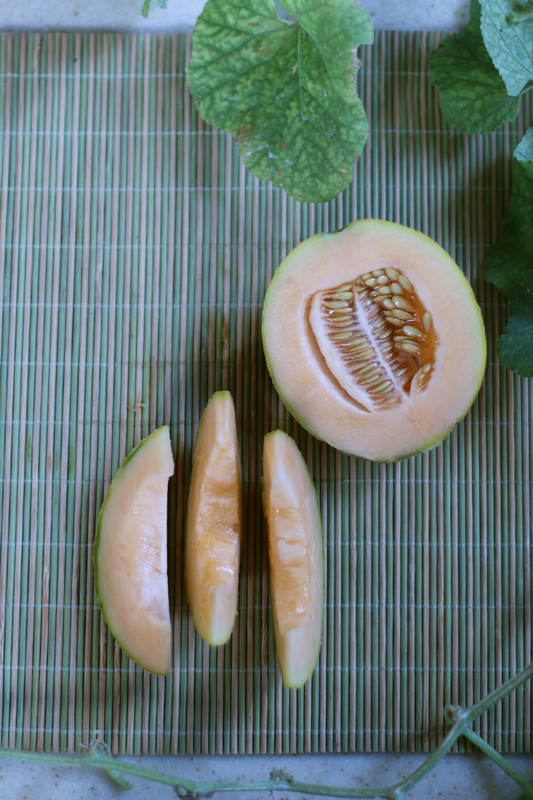 You could tell that it was a female one since it had a small watermelon-like body below its petals. The male flowers only had a thin stem. But since the petals of the female flower weren’t open yet, I had to wait until the morning to pollinate them. 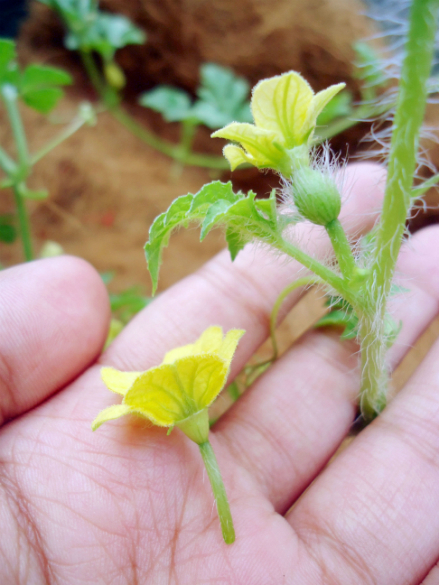 Male and female flowers of the watermelon vine. Before I slept that night, I remember thinking about it and telling God “What if it doesn’t open tomorrow morning before I leave for work? What if it opens when I’m already out of the house? If that happens, I’ll miss out on pollinating the flowers and the fruit won’t grow!” I guess it was nerve-racking for me because after weeks of taking care of the vines, as much as possible, I really would want them to bear fruit. So, I prayed about it that night and surrendered the concern to God. If He wanted it to happen, I knew that He would allow me to pollinate in the morning. When I woke up the next day, I rushed to our veranda (where the vines were) and I saw that the female flower had already bloomed. Oh my goodness. It was time! 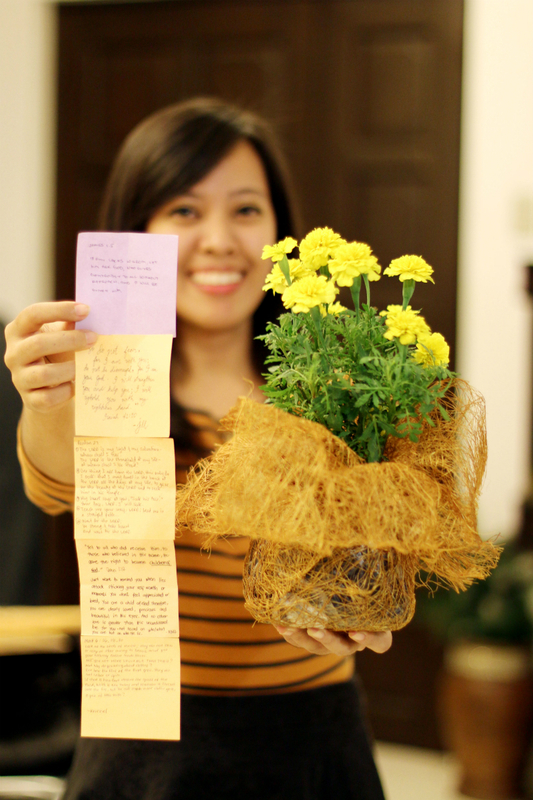 By God’s grace, the flower opened its petals early and I had the opportunity and time to pollinate it! It only took a few seconds, but the future of the watermelon fruit greatly depended on it. Haha. 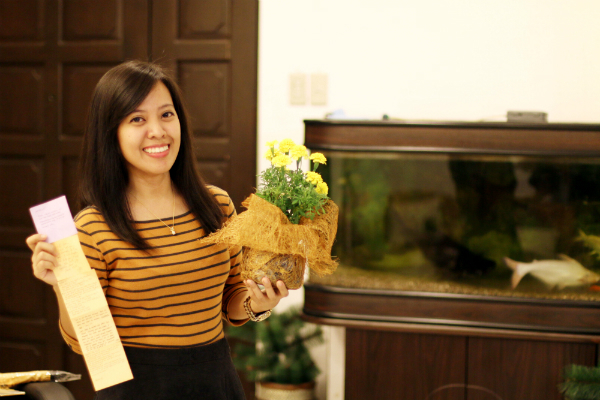 After pollinating the flower and watering the plants, I was ready to take a shower and go to work. However, while I was preparing my clothes, my mom informed me that there were some concerns with our transportation. To make the long story short, my sisters and I needed to help each other and my dad go to our respective destinations that morning using only one car. Because of the slight delay, I knew that I was going to go to work at a later time. So, while waiting, I decided to make good use of the extra time that I had at home. I ended up making a temporary cover/shield to protect the seedlings and plants from heavy rains, which was something that I couldn’t do in the evening. After about an hour, my sister graciously drove me to work and I remember thanking God in my heart for His perfect timing that morning. Even though I was worrying about the flowers the night before, He gave me peace to trust in Him and to wait on His best timing the next day. He certainly knows how to grow watermelon vines. He created them! So, I really didn’t have any reason to worry about not being able to pollinate on time or not being able to grow fruits from the vines. I started the day with a grateful heart because I was encouraged by God to always trust in His perfect timing even when things don’t make sense or when I am faced with the unknown. God can and He will do anything if He thinks it’s for the best. Male and female flowers. Watermelon vine. When I went home that night, an interesting thing happened. It suddenly rained after a hot day. It didn’t rain in the morning while I was pollinating the flowers. It also didn’t rain while I was preparing the covers and shields for the plants. But, by God’s grace and in His perfect timing, it rained at night when everything was done and alright.